A militia officer during the Revolution; governor, 1798-99; envoy to France; “father” of University of N.C. Lived in this house. William Richardson Davie, soldier, politician, and founder of the University of North Carolina, was a major player on both the state and national level. A partisan leader in the Revolutionary War, Davie was hailed for “the comeliness of his person, his martial air, his excellence in horsemanship, and his consummate power of field eloquence.” As a founding father at age thirty, Davie was said to have had “a greatness of manner in public speaking which suited his style, and gave to his speeches an imposing effect.” Davie was born on June 22, 1756, in England to Archibald and Mary Richardson Davie, both of Scottish descent. Joining Mary’s brother William Richardson, the Davies immigrated to the Waxhaws, near Lancaster, South Carolina, when William was eight years old. Davie graduated from the College of New Jersey (later Princeton) in October 1776 and proceeded to Salisbury to study law under Judge Spruce Macay. In December 1777 Davie put his legal studies aside in order to join the Patriot militia. After three months of service, he returned to Salisbury to continue his studies. Later Davie sought an officer’s commission and was appointed lieutenant of a company of cavalry in April 1779. His company soon was annexed by Count Casimir Pulaski’s legion and in May 1779, Davie was promoted to brigade major of cavalry. Wounded the following month at the Battle of Stono Ferry, Davie resumed the study of law and received his license to practice in March 1780. Just two months later, after the fall of Charleston, Davie organized a company of rangers, cavalry and mounted infantry. He embarked on a campaign of partisan attacks, harassing the enemy in the Carolina backcountry. One of Davie’s more notable engagements occurred in September 1780 in a cornfield near his childhood home in the Waxhaws, where he surprised a band of Tories that was well over twice as large as his cavalry. Davie’s men surprised the Tories who fled, leaving about forty men wounded and twenty dead. The Patriots had only one man wounded and captured valuable horses and weapons. 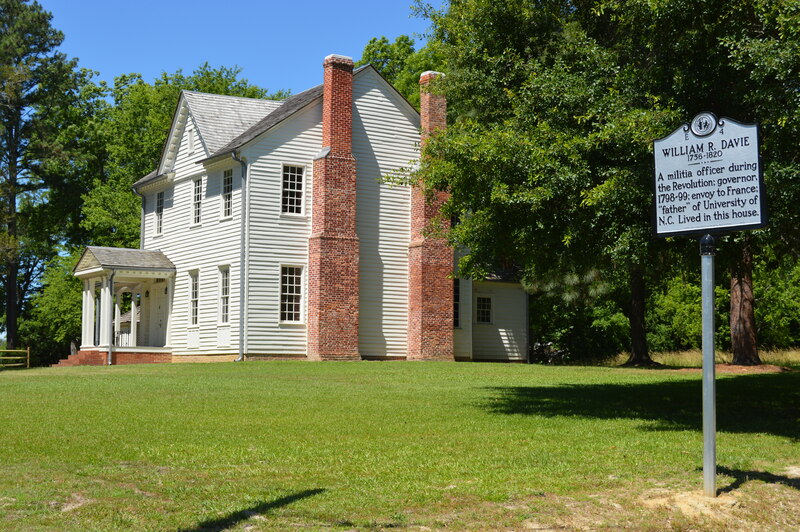 In December 1780, Nathaniel Greene persuaded Davie to serve as Greene’s commissary general, a role whereby he utilized his familiarity with the backcountry to supply Greene’s troops for the remainder of the war. In 1780 William Davie married Sarah Jones, daughter of Allen Jones of Northampton County. Davie, living in the home of his father-in-law, represented Northampton County in the lower house of the General Assembly in 1784 and 1785. He purchased a town lot in Halifax in 1781 and another five acres two years later. Shortly after the 1783 purchase, Davie built the house that still bears his name. 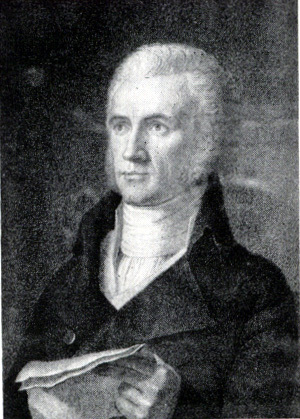 In Halifax by 1786, Davie practiced law and became more active in politics. A fervent Federalist, he would represent Halifax off and on for the next ten years. 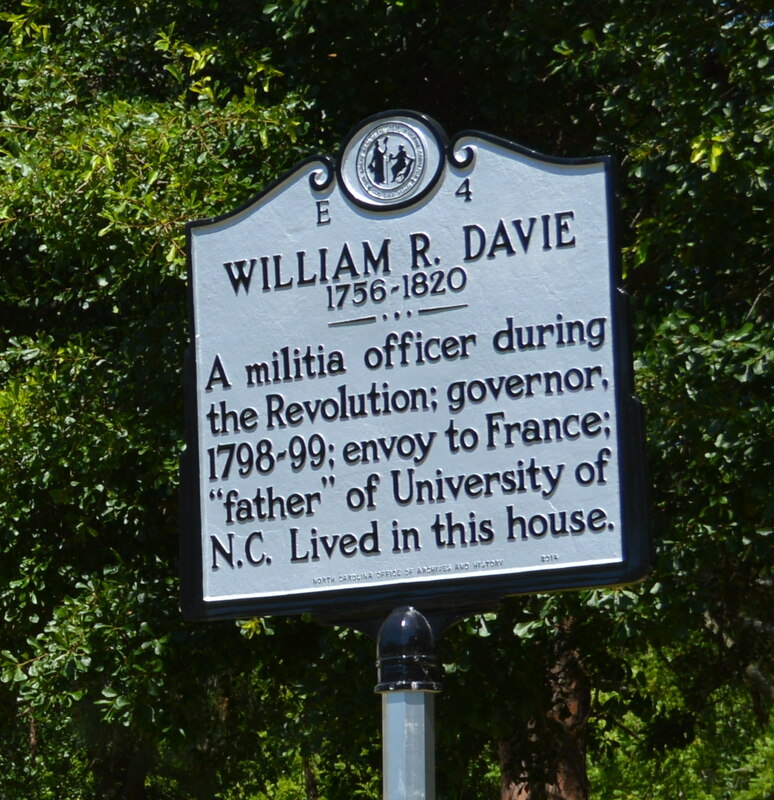 Davie was selected to be one of North Carolina’s five delegates to the Confederation Congress of 1787. The Congress, ostensibly meeting to examine the Articles of Confederation, in reality gathered to frame an entirely new form of government. The North Carolinians played a relatively minor role in what has come to be known as the Constitutional Convention. At a critical point in the deliberations, however, William Davie spoke up for the interests of the Southern slaveholders. In his pivotal statement, Davie asserted that North Carolina would not join the federal union under terms that excluded slaves from being counted for representation. Unlike other Southern delegates, Davie was flexible and willing to negotiate, because he was committed to the realization of the union. Indeed, once the three-fifths compromise was reached, Davie became an enthusiastic advocate of the United States Constitution. He spent two years campaigning for the document’s ratification. At the 1789 convention in Fayetteville that ratified the Constitution, Davie introduced a bill to [charter, I-70} a state university. As its founder, he supported and guided the [University of North Carolina, G-92] from its inception through its formative years. In 1798 the General Assembly elected William R. Davie governor of North Carolina. During his gubernatorial service, conflicts mounted between the United States and her former ally, France, with the two countries fighting an undeclared naval war. In 1799 President John Adams appointed Davie;William Vans Murray, U.S. minister at The Hague; and Chief Justice Oliver Ellsworth as ministers plenipotentiary to France to negotiate an end to the imbroglio. After lengthy and tedious deliberations—some directly with Napoleon Bonaparte—the delegation negotiated the Treaty of Mortefontaine, known as the French Convention of 1800, which improved relations between the two countries. Davie returned to Halifax after fifteen months abroad and had not been home long when he was appointed him the state’s agent in the South Carolina boundary dispute. His skillful work with the states brought Davie an appointment, from President Thomas Jefferson in 1801, as the commissioner for the United States in the arbitration of a treaty between North Carolina and the Tuscarora Indians. Saddened by Sarah’s death in 1802, his political decline, and controversies at his beloved university, Davie sold his North Carolina properties (his Halifax home was purchased by his son Allen Jones Davie) and retired to “Tivoli,” his plantation near Lancaster, South Carolina. He continued to correspond with trustees of the university and he recorded reminiscences of the Revolutionary War. William Richardson Davie died at Tivoli in 1820 and was buried at Old Waxhaw Presbyterian Church.